ISLAM: UN POCO DE LUZ SOBRE EL TERROR MUSULMÁN. The scene of the attack in the city of Turku (Jack Posobiec’s Twitter page, August 18, 2017). 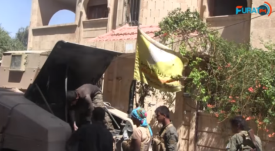 SDF fighters in west Al-Raqqah near a bullet-proof vehicle with the SDF flag (YouTube, August 19, 2017). Firing a rocket by the Syrian army at ISIS operatives in the village of Humaymah. 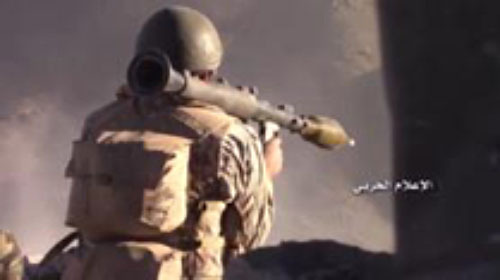 Hezbollah fighter getting ready to launch an RPG rocket at ISIS operatives in the western Al-Qalamoun Mountains. ISIS, which is facing growing pressure in Syria and Iraq, claimed responsibility for three terrorist attacks this week: a ramming attack in Barcelona (14 killed, more than 130 wounded), a ramming attack in the resort town of Cambrils, south of Barcelona (one killed and five wounded) and a stabbing attack in the city of Surgut, West Siberia (7 wounded). No claim of responsibility was issued for another stabbing attack, in the city of Turku, Finland. In the ITIC’s assessment, the attacks in Spain and Russia were ISIS-inspired attacks carried out by its supporters. It is unclear whether there is a connection between the attacks in these countries. It is possible that these are copycat attacks, which are liable to encourage additional ISIS supporters to carry out attacks, precisely in view of ISIS’s deteriorating situation in Syria and Iraq. In any event, ISIS and Al-Qaeda continue to call on operatives to carry out terrorist attacks around the world and even recommend innovative types of attacks (ISIS calls on its operatives to target diplomats, Al-Qaeda to target trains). In Syria, the Russian Air Force hit a large convoy making its way to Deir ez-Zor (according to the Russians, more than 200 ISIS operatives were killed in this airstrike); The Syrian army encircled an ISIS force in the area of the city of Uqayribat, northwest of Homs; forces of the Lebanese army, the Syrian army, and Hezbollah recorded achievements in the campaign against the ISIS enclave in the western Al-Qalamoun ridges, on the Syrian-Lebanese border. In Iraq, the ground offensive against Tal Afar, which is situated on the road leading from Mosul to the Iraqi-Syrian border, began. The attack was carried out by the Iraqi army, the Iraqi Federal Police and the Shiite militias supported by Iran. The attacking forces reportedly broke through the city’s front lines of defense and occupied three neighborhoods. The local population is fleeing the city. The Syrian army, with Russian air support, has achieved significant successes. Its forces managed to defeat a large ISIS force deployed in central Syria. The Aleppo Province was completely mopped up from the presence of terrorists. A large group of ISIS operatives in and around the city of Uqayribat was encircled (see the section entitled Main Developments in Syria). Measures designed to tighten the encirclement are still underway. The city of Uqayribat will soon be liberated. Another group of so-called rebels was encircled east of Ithriya. 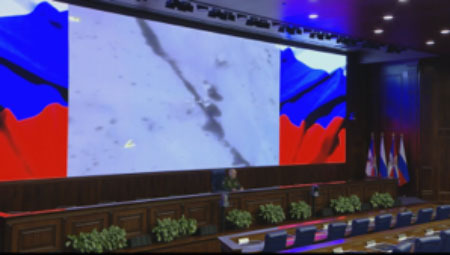 Successful offensive operations by the units under the command of General Suheil al-Hassan, with Russian air support, made it possible to achieve these results. 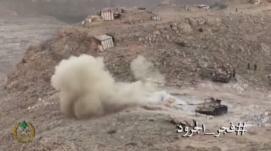 The Syrian army began to employ new fighting tactics against the terrorist groups. 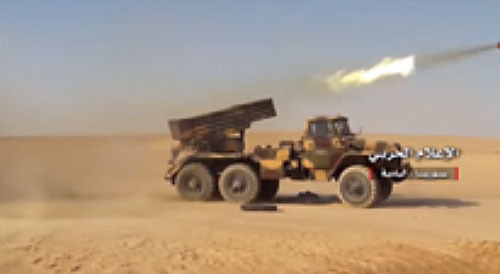 In this context, the Syrian army carried out a “tactical attack” behind ISIS lines near Al-Kadir, in the Al-Raqqah Province, 42 km north of Al-Sukhnah. The assault landing was carried out with the assistance of Russian helicopters. The Syrian forces took control of Palmyra and are now continuing the attack on Deir ez-Zor. In order to hit ISIS operatives, destroy their combat equipment and prevent them from sending reinforcements to Deir ez-Zor, the Russian Air Force carried out intensive air operations, with as many as 60-70 sorties a day. In the course of three days, the Russian Air Force carried out 316 sorties and 819 airstrikes in Deir ez-Zor. The Syrian forces, with Russian air support, are conducting an attack on Deir ez-Zor from three directions. The area surrounding the city is ISIS’s last remaining stronghold in Syria. ISIS is reinforcing its forces there. ISIS units from Mosul and Al-Raqqah were sent to Deir ez-Zor and deployed there. Nevertheless, the US-backed SDF forces are incapable of taking control of Al-Raqqah. The three de-escalation zones are operating successfully: in southern Syria, east Ghouta in Damascus, and the Homs Province. Agreements reached between Russia and the Syrian opposition made it possible for the various areas separated by the civil war to resume trading with each other. On August 21, 2017, the Russian Ministry of Defense reported that Russian planes had attacked a large ISIS convoy on its way to Deir ez-Zor. More than 200 ISIS operatives were killed and dozens of vehicles were destroyed in the airstrike. These included 20 vehicles carrying heavy weapons, including rocket launchers, as well as armored vehicles, tanks and trucks carrying ammunition (Sputnik; SANA News Agency, August 21, 2017). According to a spokesman on behalf of the SDF forces, since the beginning of the campaign they have liberated 60% of the city of Al-Raqqah (ARA, August 17, 2017). On the ground, the SDF forces encounter fierce resistance and sustain many losses. One of the battle zones is the area of the Grand Mosque in the southwestern part of the Old City. Another zone was Mansour Street, a main traffic artery in the western part of the Old City. In the western part of the city, the SDF forces reportedly regained control of some important outposts which had fallen into the hands of ISIS. 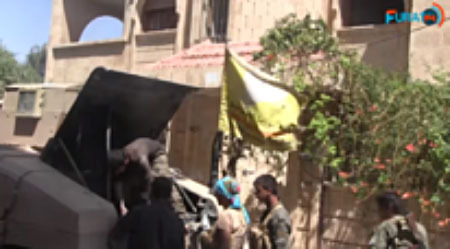 Left: SDF fighters near a bullet-proof Humvee in west Al-Raqqah. 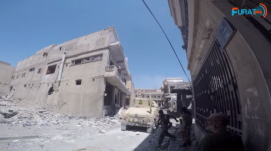 Right: SDF fighters in west Al-Raqqah near a bullet-proof vehicle with the SDF flag (YouTube, August 19, 2017). On August 17, 2017, ISIS announced that over 15 SDF fighters were killed and others were wounded in the explosion of a car bomb against an SDF outpost near the Grand Mosque. The car bomb was driven by a suicide bomber codenamed Khattab the Azeri (Akhbar Al-Muslimeen, August 19, 2017). The SDF forces announced that 95 ISIS operatives were killed in battle in various neighborhoods throughout Al-Raqqah. In these battles, ISIS detonated several car bombs (Zaman Al-Wasl, August 16, 2017). The Syrian army continues mopping up the area east of Homs and Hama, in the ITIC’s assessment, as a preliminary stage prior to its advance towards Deir ez-Zor. This week, the Syrian army reportedly encircled an area of 3,000 square kilometers east of Al-Salamiyah, about 44 km northwest of Homs. ISIS operatives are besieged in the encircled area. The main town in the encircled area is the city of Uqayribat, situated about 37 km east of Al-Salamiyah (Syria-victory, August 20, 2017). After the takeover of the city of Al-Sukhnah and mopping up the area, the Syrian army began to advance towards Deir ez-Zor. 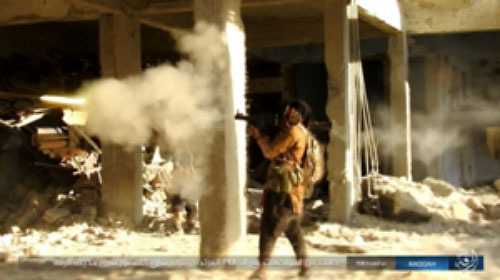 ISIS announced that its operatives had curbed the advance of the Syrian army east of the city. 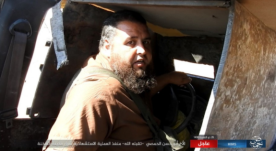 ISIS released photos showing a suicide bomber codenamed Abu Hassan al-Homsi, who detonated a car bomb against the Syrian troops east of Al-Sukhnah. According to ISIS, its operatives seized vehicles and ammunition. It was also reported that ISIS had attacked the city of Al-Sukhnah, killing ten Syrian soldiers (Khotwa, August 18, 2017). A Syrian force which advanced in the area southeast of Al-Sukhnah took over the village of Humaymah, about 96 km southeast of Al-Sukhnah. ISIS detonated a car bomb south of the village, killing fighters of Shiite militias which were part of the Syrian force. Dozens of people on both sides were killed in the battle that took place. In the village, ISIS lost several headquarters, weapons and equipment (YouTube account of Hezbollah’s military information, August 20, 2017; SANA, August 20, 2017). On August 19, 2017, a campaign was launched against the ISIS enclave on the western Al-Qalamoun ridges, on the border between Syria and Lebanon. The attacking forces have a “division of labor”: The Lebanese army attacked the areas held by ISIS in Lebanese territory from the west, while Hezbollah and the Syrian forces attacked in Syrian territory from the east. According to media reports, the attacking forces recorded achievements. Lebanese media reported that the Lebanese army had taken over half of the territory controlled by ISIS. Lebanese chief military spokesman Brigadier-General Ali Qanso held a press conference in which he announced that on August 19, 2017, the Lebanese army started a campaign called “Fajr al-Juroud” (i.e., “Dawn of Al-Juroud”; “Juroud” refers to the barren, mountainous border area between Lebanon and Syria). The objective of the campaign is to eliminate ISIS operatives in the ridges of Ras Baalbek and Al-Qaa, restoring the territory to Lebanese control and extending the Lebanese governance to the border between Syria and Lebanon. According to Brigadier-General Ali Qanso, there is no coordination, either direct or indirect, between the Lebanese army and Hezbollah, or between it and Syria(Al-Mayadeen, August 19, 2017). According to Lebanese media, ISIS has about 35 outposts and military bases on the Lebanese side of the border, with 700-800 operatives (Al-Nashra, August 19, 2017). The Lebanese army Spokesman’s Office reported that the size of the area on the ridges of Ras Baalbek and Al-Qaa where ISIS is deployed is about 120 square kilometers (Lebanon 24, August 18, 2017). Lebanese media reported that in the battles that took place so far, the Lebanese army had taken dominant hills after artillery bombardment, killed 20 ISIS operatives and seized large amounts of military equipment and weapons (Al-Nashra, August 19, 2017; Lebanese News Agency, August 21, 2017). The Lebanese army also took control of caves in the mountainous area where ISIS operatives had taken refuge (YouTube account of Hezbollah’s military information, August 20, 2017). Lebanese army warplanes attacked ISIS outposts in the fighting zone (Khotwa, August 21, 2017). At the same time, the Lebanese army is engaged in mopping up the towns of Ras Baalbek and Al-Qaa in the northern Bekaa Valley. The mopping up process is nearing its end and some ISIS operatives were killed or retreated (Al-Manar, August 22, 2017). At the same time, Hezbollah and the Syrian army attacked ISIS from Syrian territory. Hezbollah announced that its forces and the Syrian army had launched an operation called “If you return [to sin], we will return [to punishment]” (part of a Quranic verse). The objective of the operation is to remove the terror threat from Lebanon’s borders. 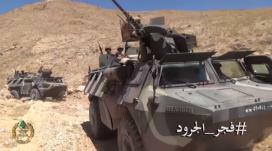 Lebanese media reported that Hezbollah and the Syrian army had advanced significantly and taken over dominant territories in the western Al-Qalamoun ridges (Al-Nashra, August 19, 2017). On August 21, 2017, Hezbollah released a video showing drones dropping bombs on ISIS outposts and ditches in the western Al-Qalamoun ridges. Hezbollah announced that hits very close to the targets were observed (YouTube account of Hezbollah’s military information, August 21, 2017). According to the ITIC’s assessment, these are probably armed quadcopters since according to the video, the targets were seen for a few seconds from the same angle of photography and at the same altitude. According to media reports, Hezbollah’s drones attacked ISIS outposts and fortifications on the Al-Qalamoun ridges (website of Hossein Mortada, August 21, 2017). Syrian media reported that Coalition warplanes had attacked an outpost of the Khaled bin Al-Walid Army (affiliated with ISIS) in the town of Al-Shajara. Khaled bin Al-Walid Army commander (emir) was reportedly killed in the attack (Khotwa News Agency; Facebook page Dimashq Al-Aan, August 17, 2017). The attack was targeted against a building of the Khaled bin Al-Walid Army which served as the organization’s Sharia (religious) court (Dimashq Al-Aan, August 17, 2017). According to reports, a new emir, from the Quneitra area, was already appointed (Khotwa, August 17, 2017). After a preliminary stage of airstrikes and artillery bombardment, the ground campaign started, with the objective of liberating the city of Tal Afar, ISIS’s last stronghold in the Nineveh Province in northern Iraq. On August 20, 2017, the Iraqi forces reportedly broke through the front lines of defense of Tal Afar. The attacking forces reportedly took over three neighborhoods in east and northeast Tal Afar. The local population is fleeing the city. At the same time, the Iraqi forces are mopping up the rural area of Tal Afar. 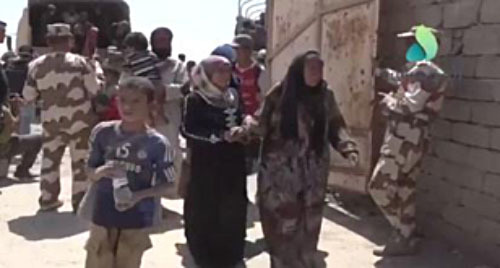 United Nations sources reported that over 30,000 inhabitants had fled the city since early April 2017 and received humanitarian aid from the Iraqi army (Reuters, August 22, 2017). Ahmad al-Assadi, Popular Mobilization spokesman, said that military advisors from Iran and Hezbollah would assist in liberating Tal Afar. These advisors will help formulating operational plans with the consent of the Iraqi government. 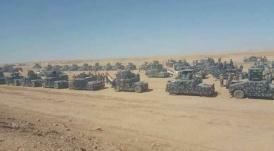 According to him, 20,000 Popular Mobilization operatives would take part in the operation to take over Tal Afar, which would last several weeks (Al-Hayat, August 21, 2017). On August 20, 2017, the Iraqi Defense Ministry published the map of the campaign to take over the city of Tal Afar. The map reveals that the confrontation zones are in the south, north and northwest of the city. The map includes details on the Iraqi forces fighting in the city and the Shiite brigades belonging to the Popular Mobilization (the Iranian-affiliated Shiite militias). It specifies the various routes of the attack and details of the forces operating on every route. Baiji (Salah Al-Din Province): Seven Iraqi soldiers were killed when a suicide bomber blew himself up with an explosive vest at the entrance to a headquarters of the Iraqi forces near Baiji (about 49 km northwest of Tikrit). Four additional terrorists firing light weapons were killed by the Iraqi army and police. The Iraqi forces had six wounded (Reuters, August 16, 2017). Kirkuk: Seven family members of a police officer in the rank of Chief Superintendent, from a village northwest of Kirkuk, were abducted and murdered by armed operatives. The officer was rescued after exchange of fire with the armed operatives. An officer in the Kirkuk police estimates that ISIS is responsible for the abovementioned attack. According to reports, in areas adjacent to the Hawija district west of Kirkuk, which is held by ISIS, attacks take place against civilians and against the Iraqi security forces (Russia Today, August 18, 2017). Baghdad area: An Iraqi army soldier was killed and another was wounded when an IED was detonated against a motorized patrol in the area of Akarkuf, about 16 km west of the city. A ramming attack on Barcelona’s Las Ramblas Boulevard, a place crowded with tourists. The terrorist attack was carried out by a terrorist who drove around 530 meters along the boulevard. Fourteen people were killed over 130 others were wounded. 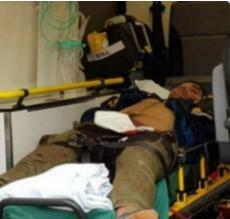 The terrorist, Younes Abouyaaquoub, a young Moroccan, managed to escape. According to a report from August 22, 2017, he was shot to death by Spanish police officers in the city of Subirats, some 30 km west of Barcelona (El Pais, August 22, 2017). Ramming attack in the resort town of Cambrils, southwest of Barcelona. The attack was carried out with a car carrying five terrorists. The five were shot to death by Spanish police. A woman was killed and five other people were wounded in the attack. An axe and knives were found in the possession of the five terrorists, which could indicate that their objective was to carry out a combined attack, i.e., a ramming attack followed by stabbing attack. A network of 12 operatives, most of them young men from Moroccan immigrant families, was behind these two attacks. The network operatives lived in the city of Ripoll, near the French border. The network was apparently headed by Abdelbaki Es Satty, the imam of the mosque in Ripoll, under whose influence the young men underwent a process of radicalization. One of the detainees stated in court that the imam had taught the network operatives that according to the Quran, being a shahid was a good thing (Reuters, August 22, 2017). ISIS claimed responsibility for both attacks, which were apparently inspired by it. It initially released a brief announcement about the attack in Barcelona (a few hours after the attack). The following day, ISIS published a more detailed announcement about the attacks in Barcelona and Cambrils. The detailed announcement is fraught with inaccuracies and, in the ITIC’s assessment, was written hastily on the basis of erroneous media reports from around the time of the attack. On the night of Wednesday August 16, 2017, there was an explosion in a house in the town of Alcanar, southwest of Barcelona, which was used by the network operatives. This was apparently a “work accident.” Around 20 gas canisters that were supposed to be used to carry out a large-scale attack in Barcelona were found in the house. In addition, a letter in Arabic was found, which reads as follows: “A short letter from the soldiers of the Islamic State in Andalus to the Crusaders, the hated, the sinners, the unjust, the corrupters” (Reuters, August 22, 2017). Andalus is the Islamic name for Spain in the Middle Ages, when a large part of it was under Muslim sovereignty. According to Spanish media reports based on reports issued by the security forces, the network planned to carry out a mass-casualty attack on a larger scale than the ramming attacks that were carried out. The attack was supposed to be carried out by planting car bombs loaded with gas canisters and explosives at three crowded sites in Barcelona. However, the attack went awry because of the “work accident” in Alcanar. As a result, the terrorists quickly carried out an alternative, simpler plan of ramming attacks. 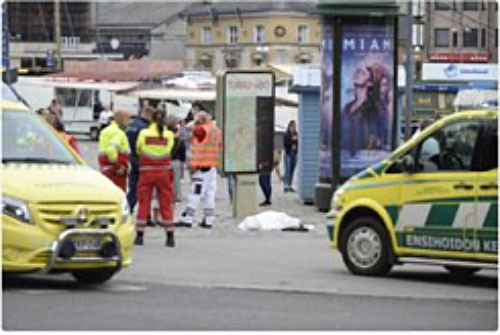 On August 18, 2017, a stabbing attack was carried out in the city of Turku, around 150 km west of Helsinki. The perpetrator attacked a group of women with a knife. According to a journalist who witnessed the attack, the attacker holding the knife shouted “Allahu Akbar”. Two Finnish women were killed in the attack and eight other people were wounded. The wounded include five women, a 15-year-old girl, and two men who were wounded while trying to protect the women. The perpetrator was shot in the leg by the Finnish police and is now in the hospital. The perpetrator of the attack is Abderrahman Mechkah, an 18-year-old Moroccan. He arrived in Germany as a refugee in 2015. In 2016, he moved to Finland and applied for asylum. His application was refused by the authorities. The Finnish security forces detained four other Moroccan citizens on suspicion of ties with the perpetrator of the attack. An international arrest warrant was issued for another Moroccan citizen (Reuters, August 19, 2017). To date, no claim of responsibility for the attack has been made by ISIS or any other organization. On August 19, 2017, at around 11:20, a stabbing attack was carried out in the city of Surgut (in the Tyumen Oblast in West Siberia on the Ob River). A young masked man armed with a knife walked along the city’s main streets and attacked passersby. Seven people were wounded, one of them seriously and the others moderately. Security forces that arrived on the scene shot and killed the attacker. According to a report by Russian police investigators, the incident is still under investigation and it has not yet been determined whether it was a terrorist attack (Sputnik, August 19, 2017). The attacker was Artur Gadzhiev, 19, a resident of Surgut. 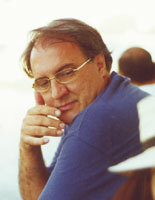 His family emigrated to the city from the Republic of Dagestan. According to reports, Gadzhiev’s father is a Muslim extremist who supports radical Islam. Artur Gadzhiev worked as a security guard in a supermarket in the city (Russia Today, August 20, 2017). On August 19, 2017 (the day of the attack), ISIS claimed responsibility for the operation. The claim of responsibility stated that “the perpetrator of the stabbing operation in the city of Surgut is one of the soldiers of the Islamic State” (Leadership Technology’s YouTube Account, August 20, 2017). After issuing its claim of responsibility for the attack, ISIS published a poster with the following caption (in Russian and Arabic): “Surgut – Blood for Blood.” The poster is apparently part of a video about the attack (in Russian) distributed by ISIS. The video shows the terrorist from Surgut, codenamed Mas’ud, reading a pledge of allegiance to ISIS leader Abu Bakr al-Baghdadi and expressing his hope of becoming a shahid. The terrorist also calls on Muslims living in the countries of the so-called infidels to carry out attacks using simple weapons such as knives or screwdrivers (Al-Furat Media Foundation, August 21, 2017). Four Lebanese brothers planned to blow up a plane belonging to UAE airline Etihad Airways. The plane took off from Australia to Abu Dhabi on July 15, 2017, carrying 400 passengers, including 120 Lebanese citizens. The Australian authorities refused to allow a passenger to board the plane with a large item of hand luggage containing a meat grinder. A search of the bag revealed the explosives. The attack was thwarted through coordination between the Lebanese security services and their Australian counterparts. The Lebanese Internal Security Administration monitored one of the brothers, Tareq Khayat, who had moved to the area of Al-Raqqah in Syria and served as an ISIS commander. Tareq Khayat was the one who recruited his three brothers to carry out the attack. The Lebanese security services eavesdropped on conversations between Tareq Khayat and his three brothers and monitored the movements of the three men from Australia to Lebanon. One of the brothers, Amer Khayat, who was detained in Lebanon when he arrived for the Eid al-Fitr holiday, was the one who was supposed to board the plane with the bomb. The other two brothers, Khaled Khayat and Mahmoud Khayat, were detained in Australia.